It seems that I was born with an interest in having fried tofu with tomato, yet only realized this not long ago. Last week, as usual I watched Luke Nguyen’s Vietnam Season 2 on SBS. A side note, Luke Nguyen’s latest released cookbook "The Songs of Sapa" was crowned amongst one of the winners of 2010 Australian Food Media Awards. In the minute I finished watching the show, that he cooked the Crisp tofu in tomato-pepper sauce on a hill top in Vietnam, my urge inside to try his dish was immediately confirmed by my daughter’s suggestion, “Would you cook this, mum? It looks tasty.” This plain, simple question uttered from a meat lover said it all. Without a second thought, I jumped on the bandwagon. The two main ingredients, tofu and tomato are always sitting in my fridge, even when the nearby supermarkets were running short of food supplies during the floods hit our state. Everything is ready and this dish is simple and easy to prepare. The end result was satisfied, fresh with lots of flavour. The crisp tofu was so good in the balanced savoury, sour and sweet sauce. Add the tofu, cooking it in two batches to ensure the oil stays hot, and deep-fry until crisp. Remove the tofu with a slotted spoon and transfer to kitchen paper to drain. Transfer the deep-frying oil into a deep bowl, leaving about 1 tablespoon of oil in the wok. Add 100ml (31/2 fl oz) water to the wok, bring to the boil, then reduce the heat to a low simmer for 10 minutes. I saw this episode! Looks just as delicious as his but did you have anything comparable to his view when he was cooking this? :) Made me want to book and ticket and fly! simple yet look very comfort! I watched that episode of Luke Nguyen's Vietnam as well. It did look good, and yours look delicious too. I think he's a really talented chef. 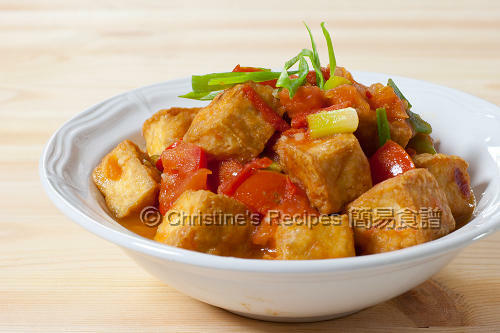 It does sound like a delicious tofu dish that a novice at Asian cuisine like me could pull off very easily! I love crispy tofu - yours look deep fried to perfection! christine, looking at the ingredients up there, i think i would love this dish, the gravy would be so tasty too, would love to try this one day. Nice! I'm always looking for ways to change up my tofu. I thought this is a Chinese style dish; whichever, I like your fried tofu. It must be a challenge to deep fry the tofu, esp when it is silken. 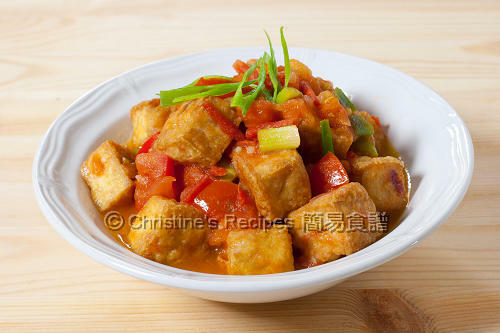 Sounds like an excellent preparation of tofu, love the texture with deep frying! This looks so good. I haven't been able to master the art of crispy tofu yet, but I keep trying. Will give this recipe a shot. Gosh, I just love simple but delicious dishes like this. Homecooked fare is the best! The picture is delicious. I'll just skip the fish sauce and get a vegan version. Thanks. I made this after seeing the show as well. Delicious! I'm making it again tonight, but baking the tofu. Unfortunately I have no coriander this time...guess I'll have to settle for garlic chives. I actually love crisp tofu but have yet to cook it. Thanks for this simple yet delicious idea. About 3 to 4 people, depends on how hungry they are. Hi Christine, I just found your blog and thought it was great, especially with the Japanese bread recipes. For this dish, I actually make this often with really good result by pan frying the tofu instead of deep frying. For a delicious variation of this dish, you can also substitute the tofu with salmon, just lightly season the salmon fillets with salt & pepper and pan frying them , then cook like above. Very good idea of using salmon. Think it'd work well for the dish. Glad that you love my bread recipes.